Below is the response I just got from SAF. All I can say, is that hope this play works, including what isn’t being made public. I’m just not happy with additional precedents being set, state by state, for the deceptively named universal background checks, exceptions or not. But perhaps the right strategy for WA is to trade a small infringement at the expense of the other side giving up a larger infringement. But from a national strategy point of view, I’m not all that sure this is wise. Regarding this from David Codrea, we have a guy, supposedly on our side, who needs a cold glass of water in the face. Please give him a splash. Be (somewhat) polite, but firm. The SAF has done a lot of good for us, particularly in the courts. But that is no reason to give them any leeway on this. Please, go here now and let them know that you do not approve. Note that responses are limited to 2000 characters, which isn’t mentioned anywhere on the contact form. So I had to shorten it and continue my note in another submission. I have long respected the SAF, particularly for the court cases it has fought, in some important cases, all the way to the US Supreme Court. I am not yet a member, but have been intending on joining soon. In the above link, if the article is correct, Alan Gottlieb has indicated his willingness to compromise on so-called ‘Universal Background Checks’, which is nothing more than precursor, and even in the eyes of the NIJ, of universal registration. Universal registration will lead to universal confiscation, which enables universal extermination. Mr. Gottlieb, I beseech you to stop negotiating with the liberty stealers. If the Seattle Times article is correct, there would not be enough votes in the legislature for this to pass were it not for your misguided efforts. I am an ardent defender of the Right to Keep and Bear Arms. I am a member of the Legislative Team of Grass Roots North Carolina, my state gun rights group. Though I am a life member of the NRA, I have long been disgusted with it’s compromises and complicit in such atrocities as the 1968 Gun Control Act. The NRA, however, has been surprisingly unbending, at least for the moment, on the deceptively named universal background checks. It will not work, and UNDER NO CIRCUMSTANCES should the government — ANY government — be allowed to know where all the guns are. It is a direct path to tyranny via eventual disarmament. Know this. Unless you back away from this effort that will give those who oppose liberty another victory in their long march against freedom, you will sully the names of the SAF and the CCRKBA forever. You will never get a dime for me and I am sure many gun rights advocates will agree. The NRA just *may* become the organization we’ve been looking for. And you will fade into the black of the American Hunters Association. 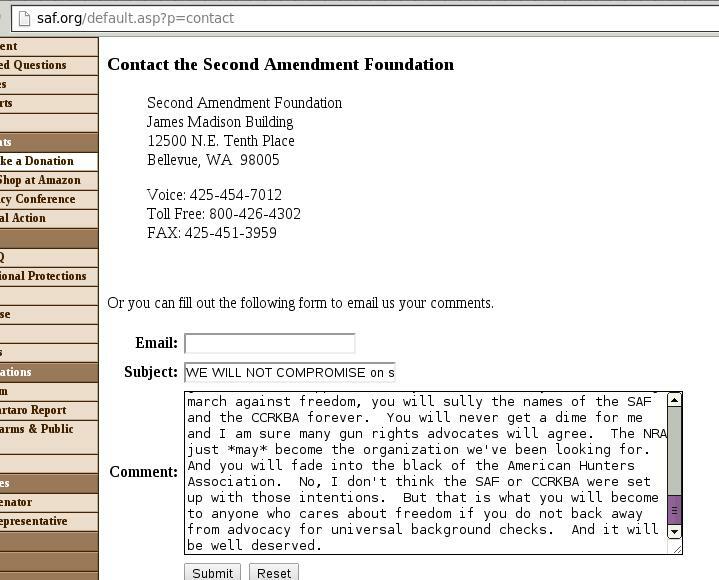 No, I don’t think the SAF or CCRKBA were set up with those intentions. But that is what you will become to anyone who cares about freedom if you do not back away from advocacy for universal background checks. And it will be well deserved. And a gun that doesn’t know the difference.